32% income tax. Thirty two percent. Almost one third! Without comparing with any other country, isn't 32% just too high to pay for lousy police, lousy government office service, and bad overall infrastructure? Being a third world country, we have the highest income tax rate in ASEAN. Singapore is at a ticklish 2%! And the pay grade is much higher over there! What! In the whole world, our income tax rate is just below New Zealand's (33%), a tie with Poland (32%), and above 9 other countries (including Mexico and Indonesia) with 30%. And we are nowhere close to the development in New Zealand and Poland. I don't feel our government deserves that much payment. I'm not very satisfied with their performance. Dear government, you need a reduction in monthly salary and bonuses until I say I am satisfied with your work. Yes, I have to be the one who gets to say you are okay. This tax rate is outdated from way back 1970s. It's really old and haven't caught up with the times. What year is it? The more money we take home, the more we can spend. Money flow all around. It's a far shot but it could increase the chance of our talented workers to find work in the country instead of abroad. But something's happening! There's hope. 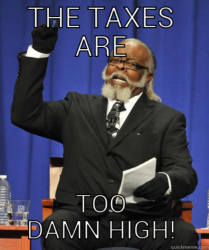 Some law makers actually realize the value of lowering income tax. Senator Sonny Angara has filed Philippine Senate Bill 2149 that aims to reduce income tax from 32% to 15% by 2015 and as low as 10% by 2017. Hell, yes. 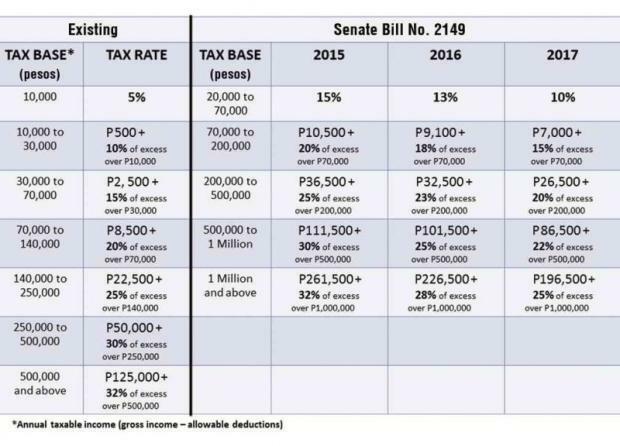 Here's a table from inquirer.net that represents what the tax rate is going to be like in the next 3 years if the bill gets approved. But be wise. If you're in the upper brackets earning above P500,000 a year, the difference isn't so big. Based on the table above, I made a sample computation of 3 different monthly salaries with the last four columns as monthly tax payable. Exhibit A gets no change in 2015. Who made the new tax formula? B saves as much as over PHP 6,000 of annual income tax by 2015. That's like two domestic round trip tickets. Lucky worker C gets back as much as over PHP 17,000 of annual income tax by 2015. Work hard, get paid hard. And bring home more of that income, buy a new tablet after a year. Senator Ralph Recto (who authored the 12% EVAT, yeah that guy) filed Senate Bill 256 to raise the cap of annual bonus exemption from a meager outdated P30,000 (also from 1970s) to P75,000. That's a huge difference in context of total year bonus. Let's say you earn P30,000 a month and you get 13th month bonus and a Christmas bonus worth one month. Without SB-256, the excess of P30,000 gets 32% taxed. Ouch. With SB-256, you get the whole P60,000 tax free! Yey! Be a citizen. Do something. The most legit thing you can do is personally contact or email the senate with your opinion. Really. Their contact details are available online. They'd love to hear your voice, too. Let them know you want these bills updated and want more of your income. Reasons. Sign the online petition for SBN-2149. Sign the online petition for SBN-256. Tell your friends about it. Personally and online. Make the idea viral. We can earn more money if our income tax is lowered. Are my calculations incorrect? Are there are other income bills I'm missing? Let me know. GMA News has posted a tax calculator that displays your taxes after the bills are passed!